MariaDB MySQL and Percona MySQL servers are two performance fork alternatives to MySQL.com’s own MySQL versions. While some folks refer to them as forks, they are in fact drop in replacements. So if you’re upgrading from MySQL 5.0.x, the same MySQL 5.1 upgrade notes apply. I’ve been playing around alot with both and lean towards MariaDB as it includes Percona’s XtraDB/InnoDB plugin but also adds additional core changes for performance especially if you still stick with MyISAM tables. To date I’ve only been doing tests on local virtualized CentOS 5.5 64bit server with no control panels. But there seems to be some demand by WHM/Cpanel users for Cpanel.net to offer MariaDB and Percona MySQL as alternatives. You can read the respective threads for MariaDB and Percona on Cpanel.net forums. Well I couldn’t wait so last week decided to replace the MySQL.com packaged MySQL server on one of my newly purchased CentOS 5.5 64it WHM/Cpanel based VPS servers. I basically, upgraded from 5.0.91 to 5.1.54 just to see if it works and more importantly MySQL recommends not skipping major releases on upgrades. So MySQL 5.0.x to 5.1.x to 5.5 if using MySQL.com releases. Then backed up all MySQL databases on server and removed MySQL 5.1.54, switched off auto updates for MySQL in WHM and installed MariaDB 5.2.4 64bit from rpm binaries for CentOS 5.5 64bit. 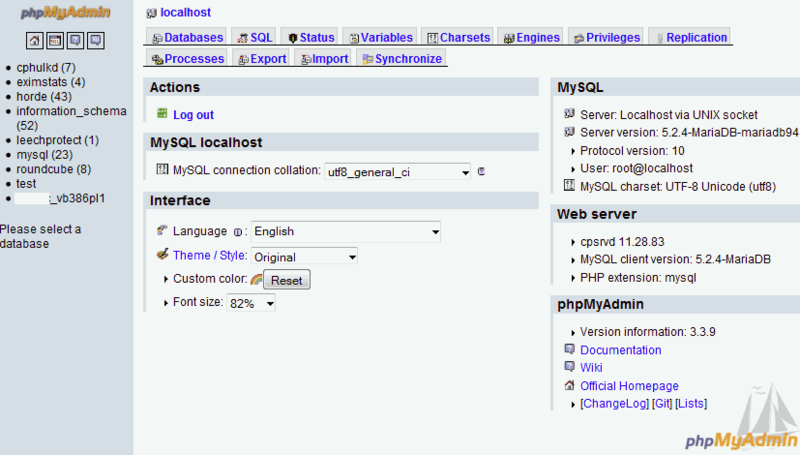 Ran mysql_upgrade and mysqlcheck afterwards and seems all is working well so far. You may need to recompile PHP and update Cpanel’s phpmyadmin as well.